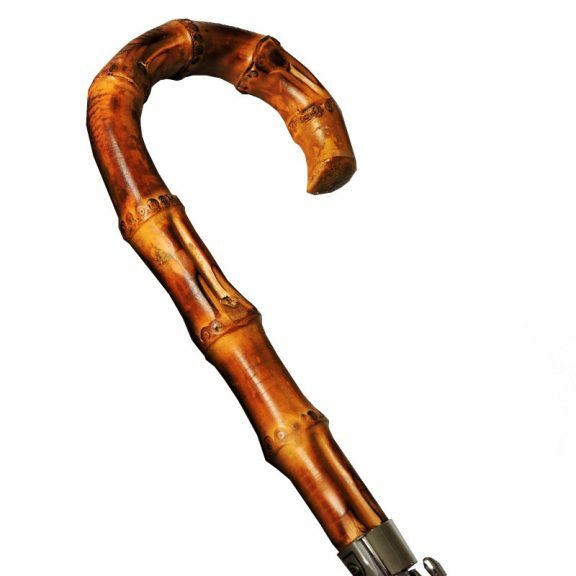 This Limited Edition Ezpeleta Handmade Java Bamboo Root Handle Umbrella really has the wow! factor. 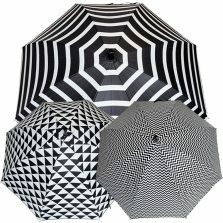 Hand made in Spain, this exquisite umbrella has a woven iridescent canopy that plays tricks with your eyes. 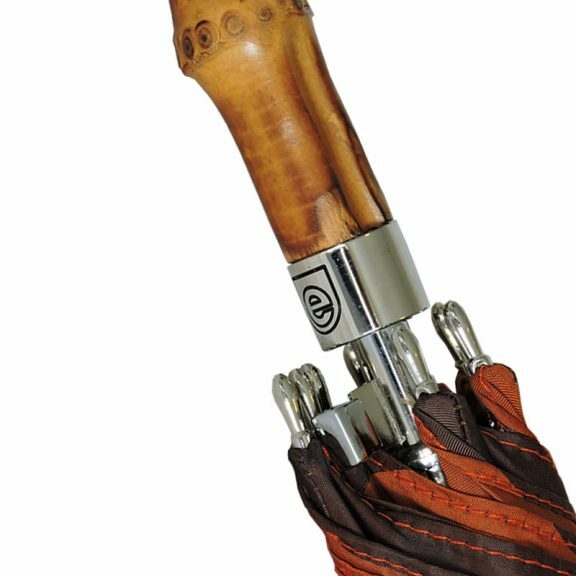 This is the superb Ezpeleta Handmade Java Bamboo Root Handle Umbrella, handmade in Spain by craftsmen with over 75 years experience, selecting the finest Italian handles and fabrics, to produce the highest quality umbrellas. 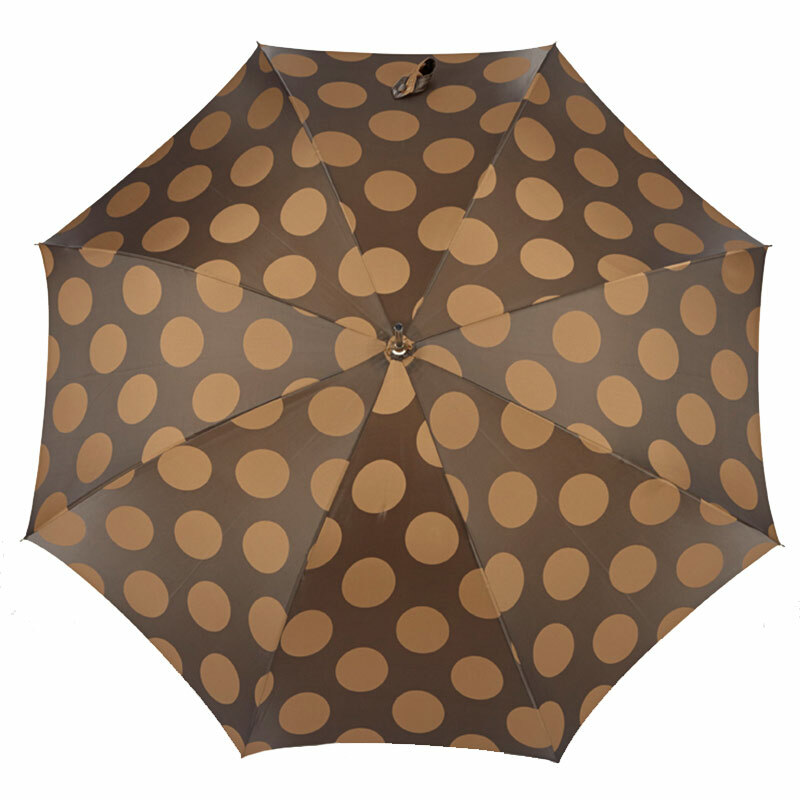 This particular umbrella has a woven canopy of a Brown background with Orange spots. The weave of the fabric gives an iridescent effect playing tricks with your eyes. Is this umbrella Brown and Orange, Black and Orange or Brown and Brown? You decide. On one of the 8 panels there is a cute little chrome Ezpeleta tag. The canopy has a kind of 70’s retro feel about it. If Vintage is your thing then you will love this design. 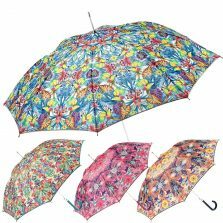 This auto open umbrella would not be out of place at any special occasion, weddings, garden parties, a day at the races etc. At approx. 109 cm (43″) the canopy is generous enough to give you plenty of coverage from the rain. In fact you could easily fit two under it. 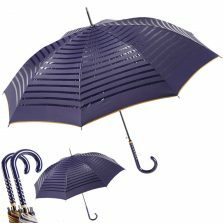 The Ezpeleta Handmade Java Bamboo Root Handle Umbrella has a chromed steel tip, chromed spoke tips and chromed branded colour at the top of the handle. The crook handle is made from a faux bamboo and has quite an ergonomic feel to it. The wrap around fastener on the canopy is made using the same woven fabric and fastens with a fabric covered button. Nothing has been spared with the attention to detail on this umbrella. 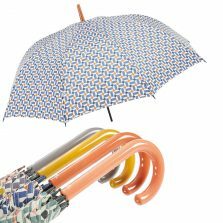 Please click Ezpeleta umbrellas to see more in this range. Click to view more of our lovely ladies walking umbrellas.